$400,000 reward offered for info on serial saboteur pushing needles, nails into growing potatoes that end up on store shelves. Potato farming is the main industry in Prince Edward Island (PEI) in Canada, but one treacherous individual has put that industry - and the safety of countless potato eaters - at risk by covertly pushing needles and nails into potatoes as they grow. The PEI Potato Board has grown desperate and put out a 500,000 Canadian dollar ($400,000) reward for information about the saboteur, reports the BBC on Wednesday. The sharp metallic objects first started appearing last October, and the reward being offered has risen steadily from 50,000 to 100,000 Canadian dollars and on to the current sum. Nails have been found by customers in store-bought bags of potatoes, indicating the potential danger posed by the anonymous saboteur. Recalling tampered potatoes has cost farmers millions of dollars. "Anyone who finds any foreign metal objects in a potato is asked to refrain from throwing out the potato, metal object or the bag it was located in when purchased," announced the Royal Canadian Mounted Police in a statement. "It's food terrorism," farmer Alex Docherty told the British Guardian. "The people doing this are cowards, lower than a snake wearing snowshoes. These are really evil people." 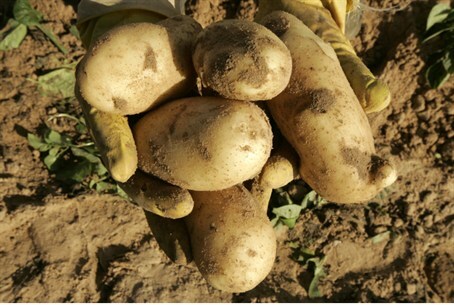 Alex Doherty, head of the PEI Potato Board, said that the danger of the phenomenon had pressed the "industry to increase the profile of this reward in order to maximize the chance that those responsible will be brought to justice." Potato farming is an industry worth over a billion dollars a year according to the Potato Board. In order to protect their crops, farmers on the island have started installing metal detectors and scanners. The scanners will cost five million Canadian dollars, although the local government will help offset the cost by donating two million dollars to the cause.